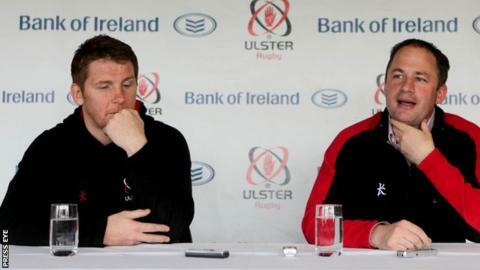 Gloucester have appointed Ulster's Jonny Bell as their new defence coach from next season. The 40-year-old former Ireland centre takes over from John Muggleton, who will leave the club when his one-year contract expires in the summer. Gloucester director of rugby David Humphreys spent 16 years as a player and coach at Ulster before moving to Kingsholm in June. "I know he's very excited about the challenge ahead," said Humphreys. "He's an individual I know very well having played alongside him and then worked with him at Ulster, and the work he has done with the Ulster squad over the past three years speaks for itself. "John has worked extremely hard to develop this group of players and, at the end of the season, he will leave the squad with a much better understanding of the defensive qualities required to be successful." As Bell's impending departure from Ulster was announced, the Irish province revealed that former Waratahs defence coach Joe Barakat would join the club as an assistant coach on a two-year contract from this summer. He has most recently been working as a coach with Japanese side Toshiba Brave Lupus. Ulster team manager Bryn Cunningham described Bell as a "tremendous servant" to the Irish province and wished him well for the future. "When Jonny told us in October that he would be leaving to explore his options and expand his coaching experience, we set out to recruit a coach that would both complement the expertise that we already have, as well as providing a fresh insight and perspective," added the Ulster manager. "We are therefore hugely excited that Joe is joining Ulster and we know that his experience of club, provincial and international rugby will be invaluable to us."